English-French bilingualism rate (%) — N.L. Population with more than one language spoken at home (%) — N.L. Official language minority (%) — N.L. Population with a mother tongue other than English or French (N) — N.L. English-French bilingualism rate (%) — P.E.I. Population with more than one language spoken at home (%) — P.E.I. Official language minority (%) — P.E.I. Population with a mother tongue other than English or French (N) — P.E.I. English-French bilingualism rate (%) — N.S. Population with more than one language spoken at home (%) — N.S. Official language minority (%) — N.S. Population with a mother tongue other than English or French (N) — N.S. English-French bilingualism rate (%) — N.B. Population with more than one language spoken at home (%) — N.B. Official language minority (%) — N.B. Population with a mother tongue other than English or French (N) — N.B. English-French bilingualism rate (%) — Que. Population with more than one language spoken at home (%) — Que. Official language minority (%) — Que. Population with a mother tongue other than English or French (N) — Que. 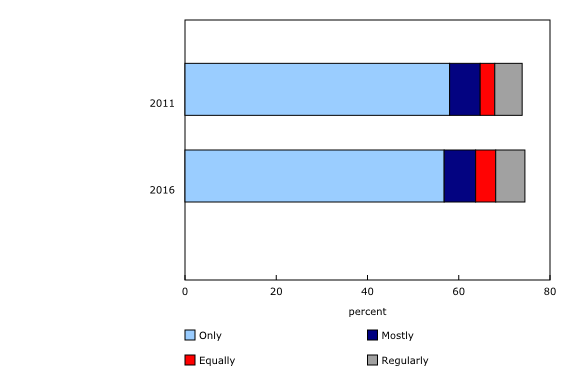 English-French bilingualism rate (%) — Ont. Population with more than one language spoken at home (%) — Ont. Official language minority (%) — Ont. Population with a mother tongue other than English or French (N) — Ont. English-French bilingualism rate (%) — Man. Population with more than one language spoken at home (%) — Man. Official language minority (%) — Man. Population with a mother tongue other than English or French (N) — Man. English-French bilingualism rate (%) — Sask. Population with more than one language spoken at home (%) — Sask. Official language minority (%) — Sask. Population with a mother tongue other than English or French (N) — Sask. English-French bilingualism rate (%) — Alta. Population with more than one language spoken at home (%) — Alta. Official language minority (%) — Alta. Population with a mother tongue other than English or French (N) — Alta. English-French bilingualism rate (%) — B.C. Population with more than one language spoken at home (%) — B.C. Official language minority (%) — B.C. Population with a mother tongue other than English or French (N) — B.C. English-French bilingualism rate (%) — Y.T. Population with more than one language spoken at home (%) — Y.T. 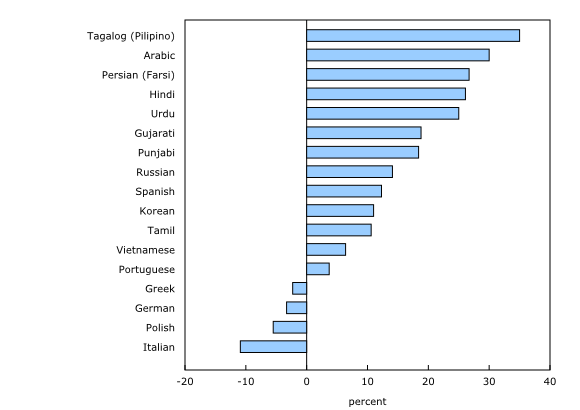 Official language minority (%) — Y.T. Population with a mother tongue other than English or French (N) — Y.T. English-French bilingualism rate (%) — N.W.T. Population with more than one language spoken at home (%) — N.W.T. Official language minority (%) — N.W.T. Population with a mother tongue other than English or French (N) — N.W.T. English-French bilingualism rate (%) — Nvt. Population with more than one language spoken at home (%) — Nvt. Official language minority (%) — Nvt. Population with a mother tongue other than English or French (N) — Nvt. Linguistic diversity is on the rise in Canada. Close to 7.6 million Canadians reported speaking a language other than English or French at home in 2016, an increase of almost 1 million (+14.5%) people over 2011. Moreover, the proportion of the Canadian population who speak more than one language at home rose from 17.5% in 2011 to 19.4% in 2016. In this context of increasing linguistic diversity, English and French remain the languages of convergence and integration into Canadian society: 93.4% of Canadians speak English or French at least on a regular basis at home. The rate of English–French bilingualism in Canada was 17.9% in 2016, the highest proportion ever. The previous high was 17.7% in 2001. There was a decline in French as a mother tongue (21.4% in 2016 compared with 22.0% in 2011) and as a language spoken at home (23.4% in 2016 versus 23.8% in 2011) throughout Canada. Languages other than English and French are becoming more common in Canada. The proportion of the population who reported an "other" mother tongue (alone or with other languages) rose from 21.3% in 2011 to 22.9% in 2016. Similarly, 21.8% of Canadians reported speaking an "other" language at home in 2016, compared with 20.0% in 2011. There was also an increase in the number of people who reported more than one language between 2011 and 2016, both for the question on mother tongue and the question on the language spoken at home. The proportion of Canadians who report English or French as their mother tongue has been declining with each census. In 2016, 78.9% of the Canadian population had English or French as their mother tongue, compared with 80.2% in 2011 and 82.4% in 2001. "Immigrant languages" refer to languages (other than English and French - the national official languages) whose existence in Canada is originally due to immigration after English and French colonization. This expression excludes Aboriginal languages and sign languages, in addition to English and French. The first results from the 2016 Census, released on February 8, 2017, showed once more that international migration is the key driver of population growth in Canada. As such, Canada's linguistic landscape is constantly changing. In the 2016 Census, over 7.7 million people reported an immigrant mother tongue (alone or with other languages). This corresponds to 22.3% of the Canadian population. Over 7.3 million people reported speaking an immigrant language at home. The main immigrant languages spoken at home by Canadians in 2016 were Mandarin (641,100 people), Cantonese (594,705 people), Punjabi (568,375 people), Spanish (553,495 people), Tagalog (Pilipino) (525,375 people) and Arabic (514,200 people). Proportionally speaking, the number of people who speak each of these languages individually represents between 1.4% and 1.9% of the Canadian population. Some languages saw significant growth from 2011 to 2016. Among the languages spoken by at least 100,000 people, Tagalog (Pilipino) (+35.0%), Arabic (+30.0%), Persian (Farsi) (+26.7%), Hindi (+26.1%) and Urdu (+25.0%) experienced the largest increases. The number of people who spoke a Chinese language at home rose 16.8% from 2011 to 2016 (see note to readers). Conversely, some European languages were reported by fewer people as the language spoken at home, led by Italian (-10.9%), Polish (-5.5%), German (-3.3%) and Greek (-2.3%). These trends reflect the changes that Canada has undergone in terms of the geographic origin of its immigrants. The number of people who speak languages from countries that are recent sources of immigration, primarily Asian countries, is on the rise. Meanwhile, the number of people who speak certain European languages—which reflect older waves of immigration—is declining. Immigrant languages are more commonly spoken in Canada's large census metropolitan areas (CMAs). The population with an immigrant mother tongue rose in every region of Canada. In absolute numbers, Ontario (+352,745 people) and Western Canada (+414,260 people) saw the largest growth from 2011 to 2016. In relative terms, the Atlantic provinces (+33.2%) and the territories (+27.6%) saw the largest increase in the population with an immigrant mother tongue, despite accounting for only 1.2% of this population in 2016. In 2011, these two regions accounted for 1.0% of this population. The population with an immigrant mother tongue is concentrated in large CMAs, with nearly two-thirds living in the CMAs of Toronto (35.3%), Vancouver (14.1%) and Montréal (13.0%). These proportions were down slightly from 2011, when they were 36.3%, 14.3% and 13.3% respectively. In relative terms, the population with an immigrant mother tongue experienced more rapid growth in the CMAs of Edmonton (+31.1%), Calgary (+28.0%) and, to a lesser extent, Ottawa-Gatineau (+15.5%). This growth was 10.3% in Toronto, 10.6% in Montréal and 11.5% in Vancouver. In Montréal and Ottawa-Gatineau, Arabic was the main immigrant mother tongue. In Calgary and Edmonton, the three most common immigrant mother tongues were, in order, Tagalog, Punjabi and Cantonese. In Toronto and Vancouver, they were Cantonese, Mandarin and Punjabi. The 2016 Census of Population provides data on close to 70 Aboriginal languages. Cree languages were the Aboriginal languages most often reported as the language spoken at home in Canada (83,985 people) in 2016. Inuktitut was spoken by 39,025 people, while 21,800 people spoke Ojibway, 13,855 people spoke Oji-Cree, 11,780 people spoke Dene and 10,960 people spoke Montagnais (Innu). Overall, the number of people who speak an Aboriginal language at home (228,770 people) is higher than the number of people who have an Aboriginal mother tongue (213,230 people). This difference, particularly significant among youths aged 0 to 14, shows the growing acquisition of an Aboriginal language as second language. In this age group, 44,000 people have an Aboriginal language as a mother tongue, while 55,970 people speak an Aboriginal language at least on a regular basis at home. More detailed analysis highlighting the richness and diversity of Aboriginal languages will be made available with the release of 2016 Census data on Aboriginal Peoples on October 25, 2017. Linguistic diversity is also measured by the growth of multilingualism in Canadian homes. Multiple languages in the homes of Canadians of all origins are becoming more common. The proportion of the Canadian population who speak more than one language at home rose from 17.5% in 2011 to 19.4% in 2016. 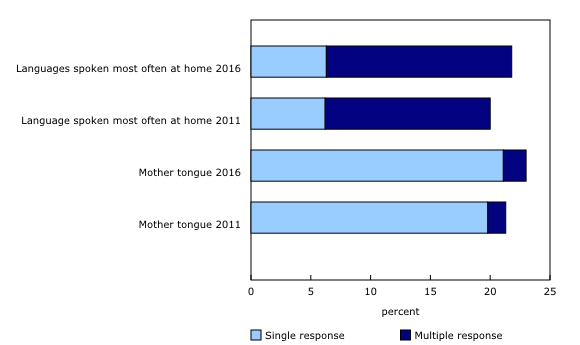 There were also more multiple responses to the question on mother tongue, with the proportion of people who reported more than one mother tongue rising from 1.9% in 2011 to 2.4% in 2016. Multilingualism primarily occurs when official languages are used increasingly with an immigrant language. For example, 69.9% of people with an "other" mother tongue (reported alone) spoke English or French at home in 2016—mostly in combination with the mother tongue. Similarly, 69.8% of people who spoke an "other language" at home (regardless of mother tongue) did so in combination with at least one of the two official languages. Overall, 98.1% of Canadians reported that they were able to hold a conversation in at least one official language in 2016, and 93.4% spoke English or French at home at least on a regular basis. Canada's two official languages embody linguistic duality, an integral part of the history of Canadian Confederation, which is celebrating its 150th anniversary this year. Highlighting the importance of Canada's linguistic duality, the rate of English–French bilingualism in Canada in 2016 was 17.9%, the highest proportion ever. The previous high was 17.7% in 2001. English–French bilingualism is growing in most provinces and territories—particularly in Quebec. Data on the knowledge of other languages will be available on October 25, 2017, when 2016 Census data on immigration and ethnocultural diversity, housing and Aboriginal people are released. In 2016, 86.2% of Canadians could conduct a conversation in English, while 74.5% reported speaking English at home, at least on a regular basis. These two proportions are up from 2011 (85.6% and 74.0%, respectively). However, the relative weight of the population whose mother tongue is English fell from 58.6% in 2011 to 58.1% in 2016. Conversely, the use of French declined at home across Canada. The French-mother-tongue population fell from 22.0% in 2011 to 21.4% in 2016 in Canada, and from 79.7% in 2011 to 79.1% in 2016 in Quebec. Similarly, 23.4% of Canadians spoke French at home in 2016, compared with 23.8% in 2011. In Quebec, the proportion of the population who spoke French at home was 87.1% in 2016, compared with 87.0% in 2011. The English-language minority (defined by the first official language spoken) represented 13.7% of the population of Quebec in 2016, up from 13.5% in 2011. In Canada excluding Quebec, the French-language minority edged down from 4.0% of the population in 2011 to 3.8% in 2016. However, it grew in the territories, rising from 4.4% in 2011 to 4.6% in 2016 in Yukon; from 2.6% in 2011 to 3.0% in 2016 in the Northwest Territories; and from 1.5% in 2011 to 1.8% in 2016 in Nunavut. There was an increase in immigrant languages as mother tongue and as a language spoken at home in the Atlantic provinces. Arabic in particular saw strong growth from 2011 to 2016 and was the main immigrant language spoken at home in three Atlantic provinces. The only exception was Prince Edward Island, where Mandarin was the main immigrant language spoken at home (2,290 people). Montagnais (Innu) (1,505 people), an Aboriginal language, was the other language most frequently reported spoken at home in Newfoundland and Labrador. French saw a decline as a mother tongue, down from 79.7% in 2011 to 79.1% in 2016. The proportion of the population who spoke French at home was 87.1% in 2016, compared with 87.0% in 2011. The proportion of the population speaking only French at home in Quebec was 71.2% in 2016, down from 72.8% in 2011. 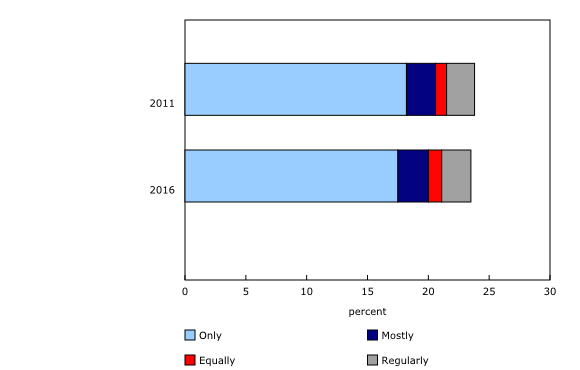 English as a language spoken at home in Quebec increased from 18.3% in 2011 to 19.2% in 2016. The proportion of the population speaking only English at home in Quebec was 6.0% in 2016, down from 6.2% in 2011. As a mother tongue, English was 8.9% in 2016, compared with 9.0% in 2011. Arabic was the most common immigrant language spoken at home (213,055 people) in 2016 in Quebec, up 23.7% from 2011. Ontario accounted for nearly half (49.5%) of Canadians whose mother tongue or language spoken at home was an immigrant language in 2016, down slightly from 2011 (50.9% for mother tongue and 51.2% for language spoken at home). Immigrant languages spoken at home rose significantly in Ontario from 2011 to 2016, led by Arabic (+30.5%), Persian (Farsi) (+24.0%), Urdu (+21.3%), Tagalog (Pilipino) (+19.3%), Chinese languages (+17.4%) and Punjabi (+14.5%). Tagalog (Pilipino) is the main immigrant language spoken at home in the Prairie provinces. From 2011 to 2016, Tagalog (Pilipino) increased 123.1% in Saskatchewan, 68.3% in Alberta and 42.3% in Manitoba. In numbers, Punjabi was the main immigrant language spoken at home in British Columbia (222,720 people) in 2016, up 10.9% from 2011, followed closely by Mandarin (202,625 people) and Cantonese (200,280 people). The number of people who reported speaking Tagalog (Pilipino) rose sharply in Yukon (+105.4%), the Northwest Territories (+58.8%) and Nunavut (+54.5%). The main "other" languages spoken at home were Dogrib (Tlicho) in the Northwest Territories (2,005 people) and Inuktitut in Nunavut (25,405 people). From 2011 to 2016, the number of people speaking Inuktitut in Nunavut rose 12.1%. All French linguistic indicators increased in the three Canadian territories. Mother tongue refers to the first language learned in childhood and still understood. Since 2001, the Census of Population has included a two-part question on the languages spoken at home. The first part (part A) asks about the language spoken most often at home, while the second part (part B) asks the language or languages spoken regularly at home in addition to the main language, if applicable. For each part, multiple responses are accepted. In this article, the statistics on language spoken at home (or language of use) include, unless otherwise indicated, all individuals who reported that language in part A or B, alone or with another language. The expression "immigrant languages" refers to languages (other than English and French) whose existence in Canada is originally due to immigration after English and French colonization. This expression excludes Aboriginal languages and sign languages, in addition to English and French. Aboriginal languages refer to languages (other than English or French) traditionally spoken by the Aboriginal peoples of Canada, that is, First Nations (North American Indians), Métis and Inuit. New instructions in the electronic questionnaire, asking respondents to indicate the Chinese language spoken at home or first learned as a child (mother tongue), as applicable, resulted in a sharp increase in certain Chinese languages, particularly Mandarin (+364,000 people, or an increase of 131.6%) and Cantonese (+180,000 people, or an increase of 43.5%). Overall, the number of people who reported speaking a Chinese language at home at least on a regular basis rose by 16.8%. As part of the efforts to correct the inconsistencies discovered in the 2016 Census language information that were initially published on August 2, 2017, Statistics Canada is releasing today three new language data tables and supporting information with the revised data. These data tables can be accessed through 'Data products' on the Census Program web module. Also available today is an explanatory note entitled Update of the 2016 Census language data, which summarizes the impact of the corrective actions taken and what users need to be aware of in regards to the changes in the language data as a result of the corrections. The remaining 2016 Census language products originally released on August 2, 2017 are currently being revised. More information on when these products will be released will be communicated in the coming weeks. Statistics Canada regrets any inconvenience caused by this error and remains dedicated to publishing high-quality information.